A bead is a small sized decorative object, which comes with plenty of colors, and sizes. There are also numerous styles and shapes to select from. On the other hand, beadwork is the craft of making accessories with beads.In beaded jewelry, beads are strung onto a soft, flexible wire, thread or fabric to create visually stunning pieces. Despite their current mainstream use, in the past people used bones and shells. Eventually, silver and gold jewelry became more popular, but they were expensive and not suited for everyone. Handmade beaded jewelry accessories, made of natural materials such as seeds, bones, corals, ivory, replaced silver and gold. Nowadays, glass is the primary material used to make affordable bead pieces available in thousands of colors and patterns. There are beads designs to experiment and work with, to create your custom-made, handmade jewelry accessories. Other types of beads available include wooden, plastic, clay, metal, shell, Shamballa style, semi-precious stone, pearl, pendants and Swarovski beads. The beads are tubular shaped and cut to a variety of lengths. They belong to the seed bead group since they are available in tiny sizes, and are useful when designing delicate beaded jewelry. The bungle beads are available in different colors, twists, and finishes. These are fine cut beads made from leaded glass known for being shiny and of high quality. They come in over 50 colors and effects, making them suitable for sewing into fabrics as embellishments and are found in wedding dresses and tiaras. Czech crystals are another less common types used in unique jewelry and are less expensive. Both freshwater and saltwater cultured pearls can be made into beaded Jewelry. Natural pearls are usually peach, mauve or pink. There are also artificial pearls also called faux or plastic pearls coated with a material, which mimics the size, shape, color, and finish of natural pearls. Saltwater pearls are more expensive than freshwater pearls and are perceived to have a high quality. They have many high cut surface which reflects light from all sides to create a sparkling effect. Another type of a faceted bead is Hex-cut beads, which are six-sided. They are gemstones and plastic beads used to create gorgeous bracelets by being woven tightly into knots on a cord. They have many meanings attached to them. There are more types of beads like metal beads, rounds beads, beautiful Bali beads from Indonesia, ceramic beads and wood beads. Wearing beaded necklaces is always very easy and fun. The accessories are inspired by different cultures and are available in many weave patterns. When buying, a beaded necklace has a rough idea of the type of beads and the colors you want. Here are some design ideas of trendy beaded necklaces. These are made using spiral ropes with clasps attached at each end. There are suitable for both casual wear and formal wear. They can feature some modern twist like the beaded crochet or have a tubular variation of the design. They are made more fun by adding embellishments, drop down beads, handmade focal beads, glass flowers or daggers. The necklace can be worn with a simple dress, and it can change a simple casual consider a chic one. In the seed beaded jewelry pattern, the glass beads are stitched together to form beautiful patterns. An idea to make the necklace unique is adding a tassel or bone. It is one of the easiest design ideas to implement. Gemstones and glass beads will make the fringe necklace appealing. Homemade fringes are charming and the thicker, the better. Another design idea; is having a necklace with different colors of pearls which make them attractive and easy to create at home, and the mix of color is simply elegant. A beaded choker is a better alternative to leather chokers. They can also have a metal pendant; crystals and gemstones can also dangle from the front or the back. For an intriguing casual or formal look, opt for the beaded choker. You can bezel a crystal, rock, bottle, gemstone, bottle caps or anything that can make a beautiful earring. The bezel can be dropped from an earring finding. Seed beads are appropriate for embezzlement, and you can wear this type of jewelry to grab attention. Fringe earrings are also stylish designs, which look beautiful when shells, crystals, pearls are added to the design. You can match them with the fringe necklace. Peyote-stitched earrings are great option for a casual and formal look. They can have attached crystals, gemstones and fringes to make them look more appealing. There are made from natural or synthetic pearls and are simple to make. Some handmade pearl ideas include the pearls drops on a shaped wire, or on a thread. 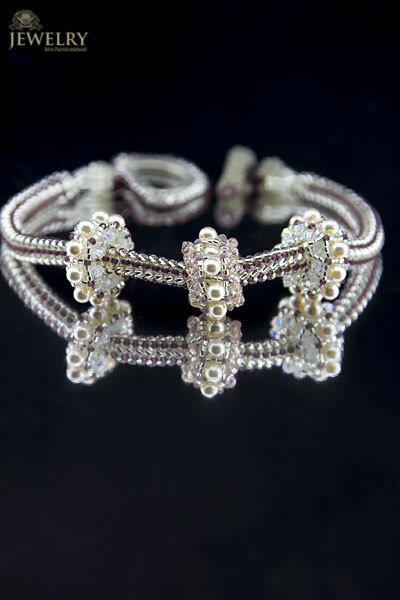 Beaded bracelets are available in different designs and finishes. There are beaded fringes and the classic beaded ropes. Daisy chains made of small seed beads are complicated to make without training but suitable for everyday wear. Beaded chain embellished with gemstones work well. Why Buy Handmade Beaded Jewelry? If you’re looking to buy quality beaded necklaces, bracelets, and earrings, you can count on us. Try your hand at making some of this accessories and source for high-quality materials. The best way to a unique style is by ordering a designer beaded necklace, on that will make you look stylish and trendy. Thanks for the comments Lovely. When you will purchase any jewelry you’ll feel all highly quality with 100% warranty. It’s interesting how many of this year’s jewelry trends are also timeless! These classic styles are great for all ages, too. The important thing is to only implement the trends that you really love.Actually This post is exactly what I am interested.Do you know what the price range of this red earrings? Gorgeous work! I LOVED your jewellery…so pretty and classic! Well done!